HP Pavilion dv7t comes in 17-inch screen and cool “liquid metal” exterior with Intel’s new Centrino 2 processor lying inside. As a result, it gives high-octane performance in an extremely shiny package. With the is 2.53GHz Core 2 Duo T9400 processor and 3GB of RAM, HP Pavilion dv7t get the score of 98 in PC Advisor WorldBench 6 real-world speed tests. It becomes a better gaming rig than many other laptops wit the nVidia GeForce 9600M GT graphics card, producing an impressive 152fps. The battery is able to last for 3 hours, It is not bad at all for a unit with a 17″ screen. The 1680-by-1050-pixel resolution makes mainstream applications pretty easy to work with. The unit has subwoofer built in, but it does’t sound like a Blu-ray movie is playing. Thus, get your headphone ready for better enjoyment. If you like shiny things, you’ll love this laptop very much. The lid and lower casing are black, but inside it resembles a slab of highly polished steel topped off with a similarly finished keyboard and icy-white status lights. The great layout design makes the smooth maneuver about the keyboard, with the wide mirrored touchpad and the dedicated number pad. The fingerprint reader is conveniently located at right-bottom-corner location. 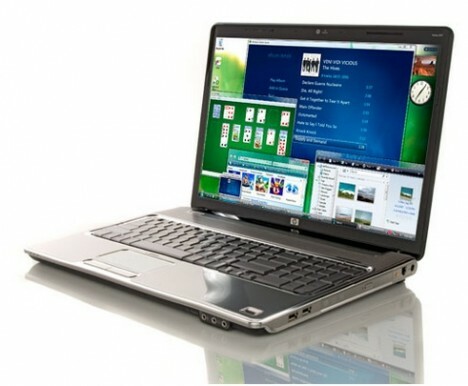 It is nicely configured with a 400GB hard drive, a Blu-ray drive, and Windows Vista Home Premium. The dv7t has proprietary left-side connection for HP’s xb3000 expansion base. Although the base is an expensive add-on, it incorporates a screen stand, a third hard-drive bay, far better speakers, and a wireless keyboard and mouse for a complete desktop experience.